There are many waters in France and abroad that contain crayfish, there’s also a few English waters with crayfish present. Crayfish can be a nightmare when fishing for carp. They are renowned for homing in on carp anglers bait, no matter what colour or flavour of boilies are used. They can turn a fishing session into a nightmare, especially if not prepared or you have no idea of their presence. When their presence in a lake is known, many anglers don’t like to put out much bait as they fear the crays will wipe them out. Crayfish Trouble when Fishing for Carp! So, the question is how can we get in good amounts of bait to attract carp without the crayfish eating them before carp find them? Many anglers tackle the crayfish problem by meshing up the hook bait so they can’t get into the bait itself. However, this may protect the hook bait but it can’t do much for any freebies that surround the rig. 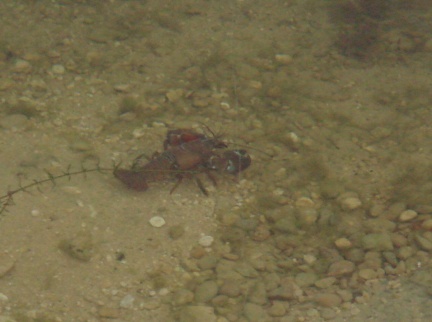 The crayfish will still eat all the free offerings and, in effect, leave you fishing with single hook baits! Getting rid of Crayfish when Carp fishing Can be Difficult! Another tactic to use on carp lakes that contain crayfish is to bait up so heavily that it purposely brings in the crayfish. The big attraction from the smell of all the bait will bring in huge numbers of crayfish, and once this happens it will cause so much commotion and movement on the bottom that the carp will inevitably move in. As the carp move in the crayfish will disappear, and this process will leave you with a ton of hungry carp feeding on top of a ton of bait! Before piling in the bait it may be best to mesh up, or put large shrink tube around the hook bait if you intend to place out a rig while baiting up. A method I like to use to gauge the presence of crayfish is to cast regularly to check the hook bait for nibbles. Once this stops, the tactic has worked and I can confidently cast out a carp rig with a normal boilie attached. 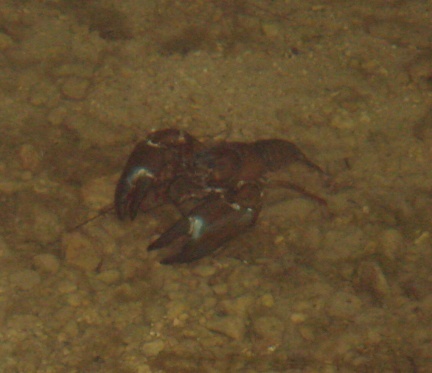 Crayfish hiding under rocks after feeding on carp baits!